現存的衍生型是C Mk VIII，它是非武裝運輸型（8,000 lb/3,630公斤）貨艙代替了原來的炸彈倉，可運載11名旅客。)以及Mk A IX 傘兵運輸機（可運送16名傘兵及裝備）。一個載人/貨版本的哈利法克斯也有生產，取名為Handley Page Halton. No. 301 Polish Bomber Squadron "Ziemi Pomorskiej"
^ Wings Encyclopedia of Aviation. London: Orbis Publishing, 1979. ^ Lake 1997, p. 131. ^ Lake 1997, p. 132. ^ 5.0 5.1 Andrew Simpson. Individual History:Handley Page Halifax B.Mk.II Series I W1048/8465M (PDF). Royal Air Force Museum. 2007 [October 28, 2009]. （原始内容 (PDF)存档于2011年6月5日）. ^ "Halifax LW170." 57 rescue website for Halifax LW170. Retrieved: 4 October 2009. Barnes, C.H. Handley Page Aircraft since 1907. London: Putnam, 1987. ISBN 0-85177-803-8. Bingham, Victor F. Halifax, Second to None: The Handley Page Halifax. Shrewsbury, UK: Airlife, 1986. ISBN 0-906393-66-3. Clarke, R.M., ed. Handley Page Halifax Portfolio. Cobham, Surrey, UK: Brooklands Books, No year cited. ISBN 0-948207-89-2. Clayton, Donald C. Handley Page: An Aircraft Album. Shepperton, Surrey, UK: Ian Allan Ltd., 1970. ISBN 0-7110-0094-8. Jones, Geoffrey Patrick. Night Flight : Halifax squadrons at War. London: William Kimber, 1981. ISBN 0-71830-338-5. Lake, Jon. Halifax Squadrons of World War 2. Botley, Oxford, UK: Osprey Publishing, 1999. ISBN 1-85532-892-5. ________. Halifax Variants. "Wings of Fame, Vol. 8". London: Aerospace Publishing, 1997. ISBN 1-86184-009-8. 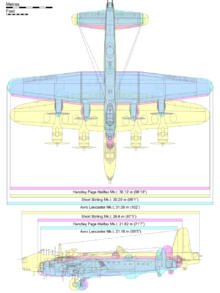 Merrick, Keith A. Halifax, an Illustrated History of a Classic World War II Bomber. Shepperton, Surrey, UK: Ian Allan Ltd., 1980. ISBN 0-7110-0767-5. ____________. The Handley Page Halifax. Bourne Ends, Buckinhamshire, UK: Aston Publications Ltd., 1990. ISBN 0-946627-60-8. Moyes, Philip J.R. Handley Page Halifax: Merlin-Engined Variants (Aerodata International No 7). Kidlington. Oxford, UK: Vintage Aviation Publications Ltd., 1979. ISBN 0-905469-50-X. _____________. The Handley Page Halifax B.III, VI, VII. Leatherhead, Surrey, UK: Profile Publications Ltd., 1966. Rapier, Brian J. Halifax at War. Shepperton, Surrey, UK: Ian Allan Ltd., 1987. ISBN 0-7110-1554-6. Roberts, R.N. The Halifax File. Tonbridge, UK: Air Britain (Historians) Ltd., 1982. ISBN 0-85130-098-7. Robertson, Bruce. Halifax Special. Shepperton, Surrey, UK: Ian Allan Ltd., 1990. ISBN 0-7110-1920-7. Scutts, Jerry. Halifax in Action (Aircraft in Action series, No. 66. Carrollton, TX: Squadron/Signal Publications, Inc., 1984. ISBN 0-89747-158-X. Stachiw, Anthony L. and Andrew Tattersall. Handley Page Halifax: In Canadian Service St. Catharine's, Ontario, Canada: Vanwell Publishing Limited, 2005. ISBN 1-55125-085-3. 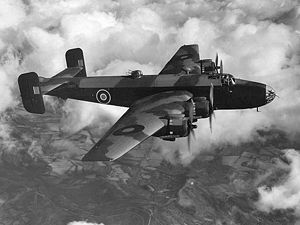 Halifax at War: The Story of a Bomber（76 min. DVD）. Toronto: Nightfighters Productions Inc., 2005. ISBN 1-55259-571-4. To Hell in a Halifax, by Herbert Krentz The true story of RCAF pilot Herbert Krentz, the sole survivor when his Halifax Mk V was shot down over Germany in early 1944.